I think my little sister is growing up. In my mind she has always been that sweet girl with long legs, shiny blond hair, and an obsession with "Hanson". 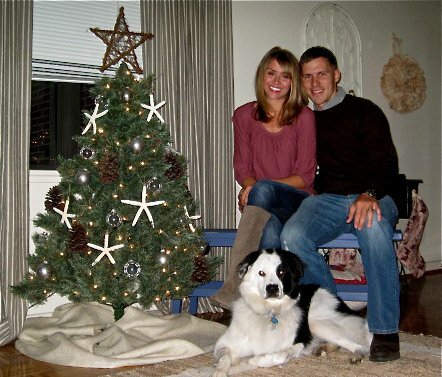 But now that I see her fabulous "Coastal" Christmas decorating, that image I had of her doesn't seem to fit anymore. For example- she recently refinished this antique Singer sewing table. 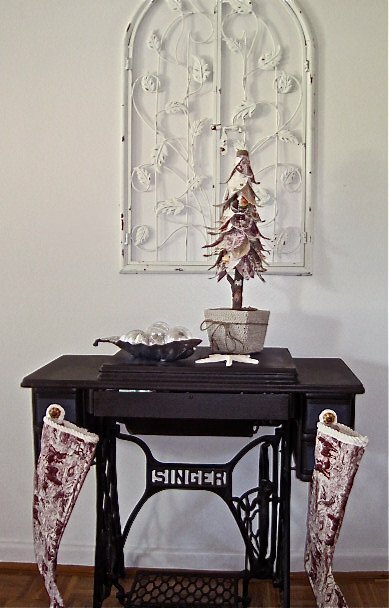 Since her home does not have a fireplace, she is using the sewing table to hang her stockings and display a Christmas vignette. 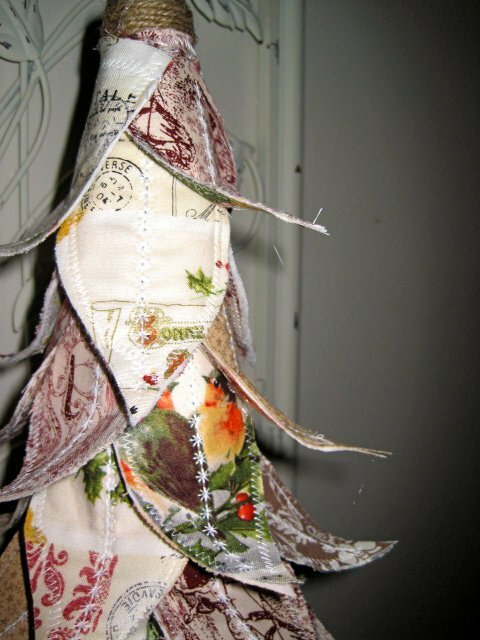 She made her own stockings using toile fabric. She decided on a "Coastal" theme after our visit in November. While we were together, we took the girls to the beach to build sand castles and gather shells. 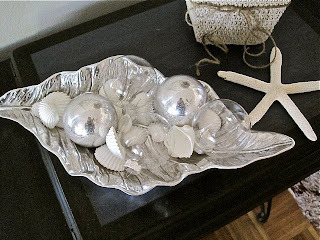 Her collection of ornaments is mixed with shells that we found together. 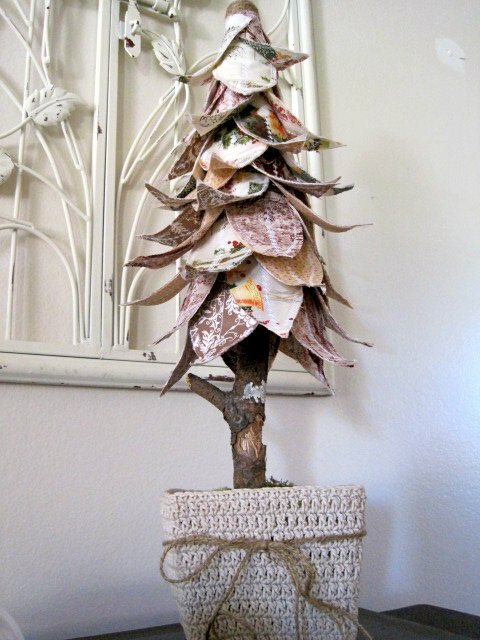 My favorite part of her decor is this tree. She saw a similar one on etsy and decided to make her own version. 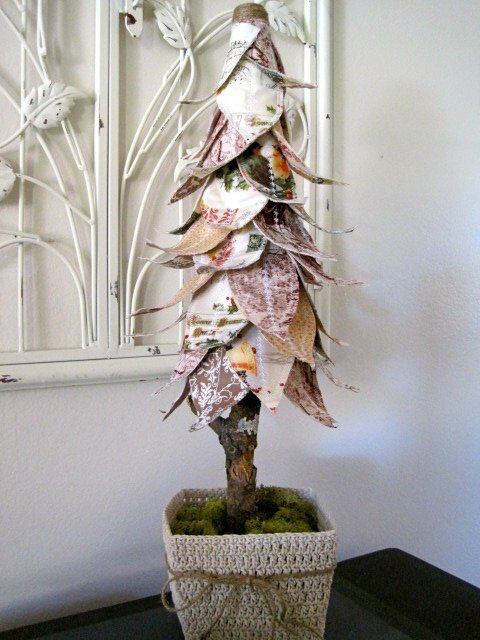 I like this tree because you could display it year round- depending on fabric choice. Or you could do it seasonally, with fun theme fabric. She recently learned to quilt while her hubby was deployed in Iraq. She used those new skills to sew each 'leaf' for the tree. Then she attached them to a foam cone from Hobby Lobby and shoved a branch (from her yard) in the bottom to serve as a trunk. Jute twine was used to cover the top of the cone. I love how it looks like a little potted tree. 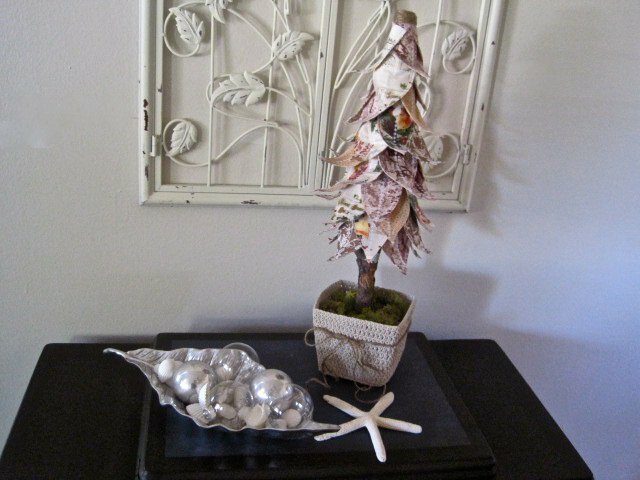 In the container, the tree is 'rooted' in floral foam and covered with reindeer moss. Funny story... my sister ordered this cute Christmas tree online. Unfortunately, when ordering she didn't notice that the tree height was only 4 feet! I think her petite tree is gorgeous. Star fish and pine cones- yum! Samantha you're so sweet! Thank you for this great post. 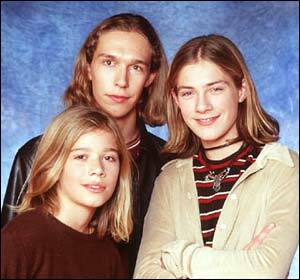 That picture of Hanson is hilarious.. I can't believe how much I loved them. Haha! I love you! Thanks for showing off my Christmas decor! Great job Amanada!! So cute!